Quin Candy in Portland, Oregon is the real deal. In my various travels, I’m still surprised at how rarely I come across honest-to-goodness, small-scale, quality-focused candymakers. I don’t mean chocolatiers or bakers or pâtissiers, which every bigger city is lousy with. And I’m not including marshmallows, because damn those evil things to hell. I mean candy. Actual candy. Sugar confectionery. 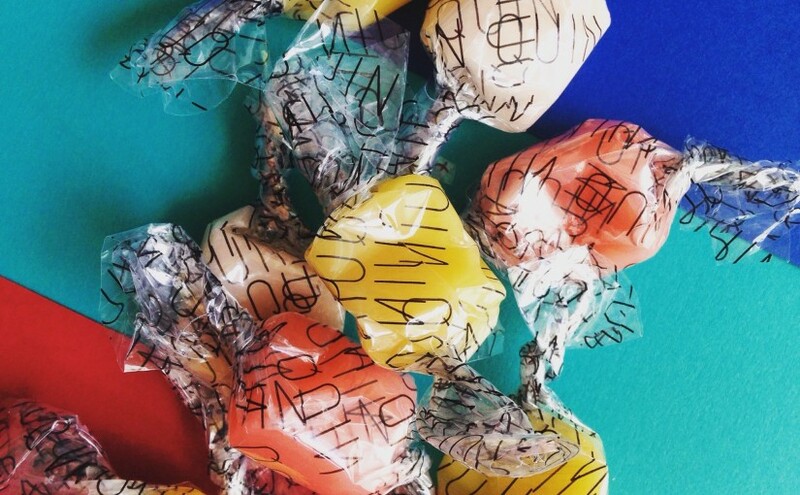 In this sense, Quin Candy is the real deal. Founded by Jami Curl in Portland, Quin makes everything by hand, more or less from scratch, and actually focuses solely on candy. That gets a major fist pump from me. Now, Portland does tend to deserve its Portlandia-style reputation as a place where the commonplace goes to become precious. But this is a case where I am definitely not complaining. 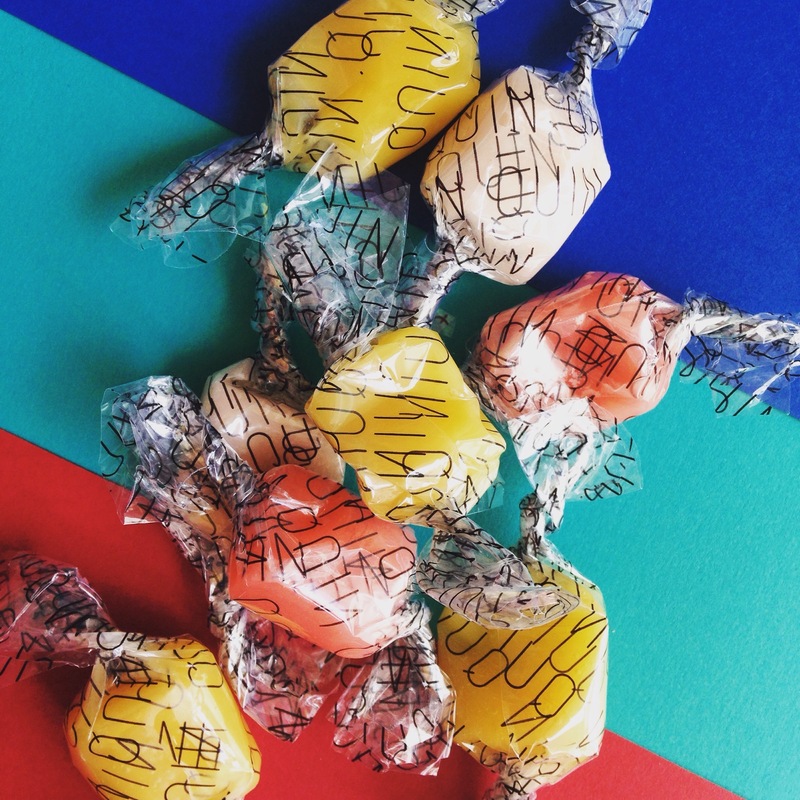 Back in March, I popped into Quin’s tiny Union Way shop — really, a kiosk with a door in a funny little shopping arcade between Stark Street and Burnside — and spent the most money I have ever spent on candy in one go. “Dreams Come Chew” are your classic chewy fruit taffies, in cherry, strawberry, tangerine, lemon, fruit punch, and pineapple and coconut. The flavours are vibrant and appealing and have some complexity; although all-natural, they’re definitely manufactured-tasting. Quin’s chews have a tender, smooth, and fairly long bite that can make them tricky to get out of their wrappers. They don’t seem as highly pulled and aerated as typical saltwater taffy, which I actually prefer since it makes the chew longer and more slippery on your tongue as it dissolves. Great stuff. Some flavours in the batch I bought had crystallized in their wrappers, which gives them a shorter, fondant-style texture and a bit of crunch between the teeth. Definitely not intentional, but honestly still nice. This is not a milk-drinking technique that I experienced as a kid, but these are still oddly intriguing. The combo of cow’s milk—which is often kind of sweaty and animalic, especially if you don’t eat it often—with cinnamon—which itself has an unwashed undercarriage vibe if you play close attention—adds up to a provocative taste that I can only call human. The Caucasian-skin-toned colour of the pieces reinforces that impression. I also made off with gumdrops in Smoked Cola and Tea + Lemonade flavours. Gumdrops is kind of a vague term; here it means gummy candies, made with gelatine from an unspecified source. Of the two, the cola ones were my favourite. If you don’t like smoky flavours, you won’t be put off by these — they’re very subtle. In fact, that’s what’s keeping me from really loving either of the flavours. They’re just too meek, lacking boldness and acidity, especially compared to the chews. They’re also too damn big. These would be twice as good if they were half the size. Something about gummies just doesn’t scale up well, and these are reminiscent of gnawing on a big fat pendulous earlobe. 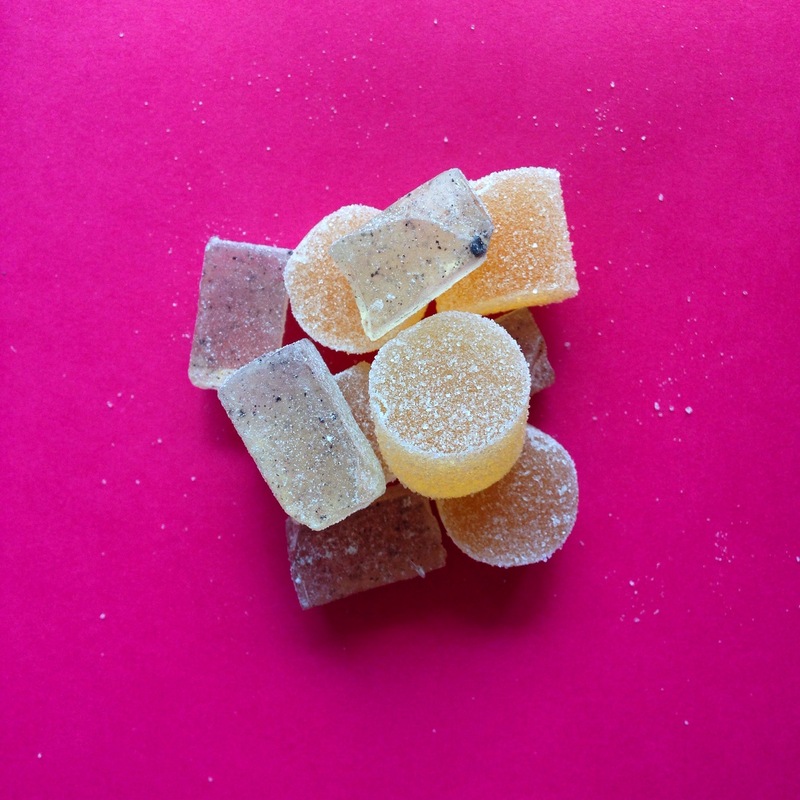 Still, with a nice natural complexity to the flavours and the addition of local produce in some of the varieties, these land way above your standard drug-store peg-bag gummies. If you don’t mind eating gelatine — again, I’m breaking the rules here for science! — these are a smart way to blow your junk food money. Gumdrops in “Smoked Cola” flavour, plus root beer hard candy, all by Quin. Last but not least, some old-fashioned hard candy in root beer flavour. These rustic sort-of-cubes have an awesome hand-hewn look to them, and the vanilla bean bits locked inside help them feel even more special. You’d be hard-pressed to guess these are root beer without reading the label. In truth, they are pretty well straight-up oil of wintergreen. Powerful, tongue-numbing wintergreen. I happen to love wintergreen, but Germans and Brits will not be fond of these, I’m guessing. I also tried some of Quin’s other offerings — lollipops and soft caramels in a number of flavours — but those will have to wait for another day and another post. Suffice it to say, if you’re looking to rebel against your dentist, Quin is an excellent place to start. Previous Previous post: Spring, dammit. Next Next post: What is turrón? Seriously, Spain, I need to know.